The aftermath of yesterday’s bomb attack. A one-million peso reward has been offered to help catch the culprits. Picture by the Philippine Red Cross, via Twitter. 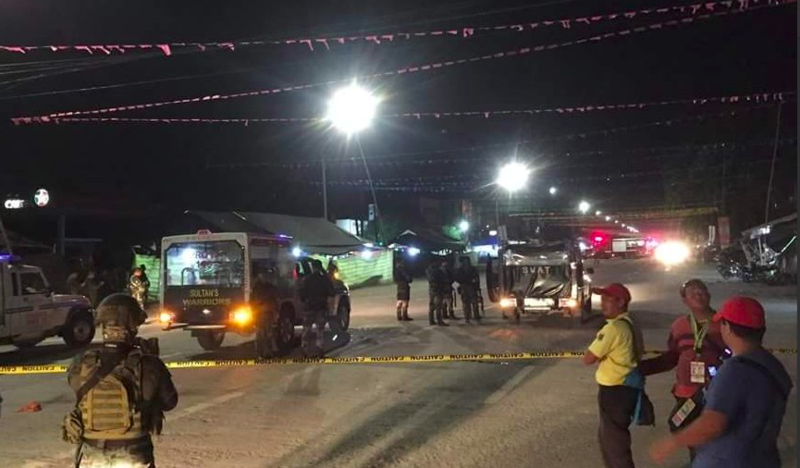 A one-million peso reward has been offered to catch the terrorists behind a bomb attack at a crowded festival in Sultan Kudarat province. Two people – including a seven-year-old boy – were killed and dozens injured in the attack yesterday (Tuesday, August 28) in Isulan town. Provincial governor Sultan Pax Mangudadatu announced the reward money today. He also said the local government would provide all necessary resources to speed up investigations. Responsibility for the attack has been claimed by the Islamic-State affiliated Bangsamoro Islamic Freedom Fighters (BIFF). “Let’s all pray that these perpetrators will be captured soon,” he told reporters after visiting victims at the provincial hospital. The explosion came three days before the culmination of the town’s 7th Hamungaya Festival and the province’s 61st foundation anniversary celebration. Mangudadatu said the incident was “very painful” for the province and called it a “barbaric act perpetrated by animals”. The explosion occurred at 8.34pm near the ‘ukay-ukay’ [second-hand clothing] stalls along the national highway in Barangay Kalawag 3. Two more explosives were recovered near the blast site and later disarmed by an explosive ordnance disposal team. The governor said the provincial government would shoulder all the medical needs of the victims and assist the families of the two fatalities. They have been identified as Davy Shane Alayon, aged seven, of Bagumbayan town and Lenie Ombrog, 52, of Barangay Sampao. As of noon today, at least 22 of the wounded remained in hospital, while 15 others have been discharged. Welmark John Lapidez, 23, who was listed in critical condition, was transferred this morning to the General Santos Doctor’s Hospital. “We’re planning to transfer those remaining who are in serious condition to private hospitals that have more complete facilities,” Mangudadatu said. Meantime, Isulan Mayor Marites Pallasigue said the town’s forthcoming festivities had been cancelled due to security concerns. Instead, a simple anniversary mass and prayer for the victims will be held at the municipal gymnasium.